Little kids come to their parents when they get hurt so they can get a kiss to make it better or put a band-aid on so the hurt will go away. Wouldn't that be nice if it worked that way as an adult? But more often than not our hurts can't be fixed with a kiss or a band-aid. Some of our deepest hurts will never go away. We just learn how to continue on with the wound that in time hopefully will start to heal and eventually become a scar. Sometimes the scar fades away and other times the wound is so deep that we are scarred for life. That scar is a reminder of a past hurt, but it can also remind us of the healing that took place. 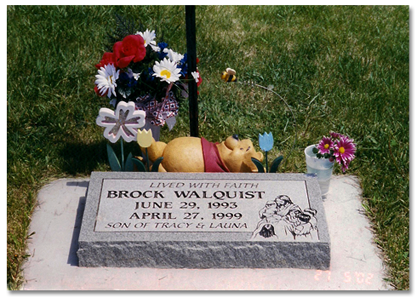 Brock had several surgeries in his life but not all the scars were visible. In fact, he only had a couple that could be seen, one on his chest from the central line (his tubes) and one on his neck from the tracheotomy. All the others were inside and they were all from deeper surgeries. To look at him you wouldn't know what he had been through. In a TV news report they taped Brock riding a big wheel bike with his friends at a daycare. The news clip was informing the viewers of a benefit that had been arranged by one of the daycare parents to help with medical expenses. The reporter stated that watching Brock ride around on the bike, you wouldn't know he had terminal cancer. When Brock died I was completely lost. I didn't know how to deal with my emotions mostly because I had never felt this kind of devastation before. Mixed in with these emotions were my feelings of responsibility to Tracy and Mitch. I needed to be strong for them and at the same time they were being strong for me. In addition to the emotions and responsibility there was enormous fear. I was so fearful that something would happen to Tracy or Mitch that I mentally would try to work out every situation so that all hazards could be avoided. Mitch wasn't allowed to cross the street by himself anymore and if I could have gotten away with it, he would have been wrapped in bubble wrap from head to toe. If Tracy was late coming home from work or if a drive to the store took longer than I thought was needed, I would imagine every possible accident that may have detained him, always fearing the worst. When he did arrive home I would say a prayer of relief and thanksgiving that he had returned safely. That same fear was with me during the day while the three of us were separated by work and school. It was getting harder to contain my own emotions. I could keep it together until I was in the car for the commute to work. They when I was alone I would cry all the way to work. Once there I would re-apply my makeup and put on the "I'm fine" face. This would last until lunch time when I would spend my lunch hour crying at Brock's grave. Then again I would fix my makeup and return to work. As you can imagine this was exhausting and I could barely make it to the end of the work day before breaking down again and crying all the way home. I didn't want to upset Tracy and Mitch so I would avoid crying in front of them as much as possible, but I felt like I couldn't stop crying. It was all too big. After only a few weeks I started to break out in hives and my eye started to twitch. I called the eye doctor and he asked if I was under stress and if so I needed to relieve the stress and my eye would take care of itself. Great idea, but how could I do that? Tracy and Mitch grieved in a completely different way than I did and at the group I learned that everyone grieves in their own way and that's okay. The few times I attended the group were very helpful and the only thing missing was the message of hope. The group was helping me understand the emotions I was currently dealing with, but I needed hope for the future. I needed to know that I would see Brock again and I needed to know where he was.3 Without that hope it wouldn't matter how well I understood my emotions. God, the Father of compassion4 gave us that hope. 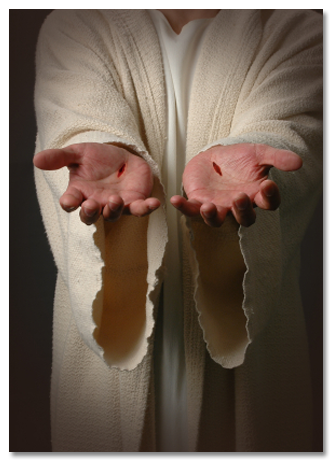 He had orchestrated all the events leading up to our acceptance of faith in his son, Jesus Christ. They were all perfectly timed and served his purpose. Although we had only been believers for about a year when Brock went home, we cannot imagine ever going through the loss without knowing about God; we couldn't do it. Although Mitch was young at the time, he always tried to comfort me and be strong for me. I would watch him and my heart would break seeing the loneliness that he was dealing with. He had lost his brother and best friend. One morning he walked into the kitchen smiling and looking just as happy as ever. He asked if we could talk and he proceeded to tell me about a dream he had. He said he was asleep and felt like Brock had jumped on him while lying on his bed. He said he woke up and Brock was there asking how he was doing and if he wanted to play tag. Mitch said yes and they started running around. Excitedly Mitch told me, "Mom, Brock runs without a gallop and he can run fast." He also said that Brock smiled at him and said, "Look at me teeth, they are all new." Mitch said they ran around and played in a really beautiful place. There was a very bright light coming from a room and Mitch asked what was causing the light. Brock told him it was Jesus. He also told Mitch that he was fine and that he would be okay staying with Jesus. They started to run around again and Brock reached out and touched Mitch and said, "You're it." Mitch said he jumped like you do when your startled in your sleep and when he did he was awake back in his own room. He said he wanted to go back and play some more with Brock. Then he said, "Mom, Brock is okay, he's with Jesus." What a gift of hope and compassion that was. On Brock's birthday Audra and I gathered up the kids and took balloons to his grave. Whenever we buy balloons the wind blows. Have you ever tried to load balloons into your car with the wind blowing? It can be pretty comical. We had conquered the first task of loading the balloons, now we were at the grave site and ready to release them. With all the kids out of the car and balloons in hand we counted down to the release. Right on queue the sprinklers started and we were caught in the middle of the cemetery. Once we were all back in the car we wondered what Brock would have done if he was watching, then we all laughed out loud knowing that if he was watching he would have been laughing with his hand over his mouth. That was a good day.
" The LORD is close to the brokenhearted and saves those who are crushed in spirit."